In his famous Gettysburg Address, President Abraham Lincoln said the Civil War was a conflict that would test “whether a nation conceived in Liberty, and dedicated to the proposition that all men are created equal” could long endure. More than 150 years later, we’re once again seeking the answer to that question. It’s no secret that American society is polarized and fractured. As we’ve moved further right and left, it seems many have lost sight of the ties that bind—those indispensable elements that created and shaped our common life. And all this leads to a single question: What kind of future awaits an increasingly fragmented society? Enter Jonah Goldberg, who in his latest book, Suicide of the West: How the Rebirth of Tribalism, Populism, Nationalism, and Identity Politics is Destroying American Democracy, attempts to wake us from our stupor in hopes of averting disaster. Goldberg—senior editor at National Review, fellow of the American Enterprise Institute, syndicated columnist, and frequent Fox News pundit—is one of America’s leading conservative intellectuals and a keen observer of politics and culture. Crown Forum (2018). 464 pp. $28.00. With his trademark blend of political history, social science, economics, and pop culture, two-time New York Times bestselling author, syndicated columnist, National Review senior editor, and American Enterprise Institute fellow Jonah Goldberg makes the timely case that America and other democracies are in peril as they lose the will to defend the values and institutions that sustain freedom and prosperity. Instead we are surrendering to populism, nationalism, and other forms of tribalism. In the book, he musters wit and wisdom to make the case that our current trajectory is nothing short of an existential threat to the survival of Western society and that only a fundamental course correction might save us. Goldberg writes in defense of a miracle, one he claims transformed the Western world. Using economics to illustrate this change, he argues that until the 18th century, poverty was a nearly universal human experience, but as a result of “the Miracle” humanity has taken a “quantum leap out of its natural environment of poverty” over the last 300 years (7). He defines the Miracle as a new way of thinking about the world. It was “an unplanned and glorious accident,” which sprung from the Enlightenment, specifically the revolutionary ideas of English philosopher John Locke (105). As Locke’s ideas—centered on limited government, the sovereignty of the individual, and the natural rights of man—began to work their way into the popular sentiment, a radical shift took place in the way that “humans thought about the world and their place in it” (8). Ultimately, Locke’s theories formed the basis of classical liberalism, and Goldberg posits that the combination of liberalism and free market capitalism created the Miracle. He not only credits the Miracle with the formation of the modern West, but also claims it brought about the single greatest period of human progress, innovation, and achievement in history. From the outset, Goldberg’s concern is clear. The Miracle created the modern West. The United States of America is the Miracle’s most visible triumph (11). And all of it is in peril. Suicide of the West is provocative and formidable, a sweeping three-part narrative of the development of contemporary American culture and what ails it. Goldberg begins by introducing the Miracle and chronicling the destructive power of human nature. In part two, he discusses the makings of modern America, tackling the formation and history of capitalism and liberal democracy. And in the final section, he turns his attention to present threats to the Miracle’s survival. Goldberg is at his best when he speaks of human nature. He understands the innate moral sense every person possesses. He discerns the weaknesses of our fallen state (e.g., pride and greed). He recognizes our inclinations toward tribalism are more than learned behaviors but exist at the level of instinct. Most importantly, Goldberg grasps humanity’s quest for meaning—our compulsory habit of imbuing the world around us with “significance beyond the rational and material” (44). As he tells the story of the Miracle, we learn that Goldberg views civilization as the “collection of stories we tell ourselves” (88). And he’s right; the status of our common life is largely determined by these stories and conversations. The West hasn’t only taken shape against the backdrop of clashing ideas (e.g., Locke vs. Rousseau, capitalism vs. Marxism), but as it developed, the United States in particular has been undergirded by a common moral sense arising from widespread religious convictions. Religion has loomed large in America’s “stories,” and Goldberg describes with precision its indispensable role in the Miracle’s success. 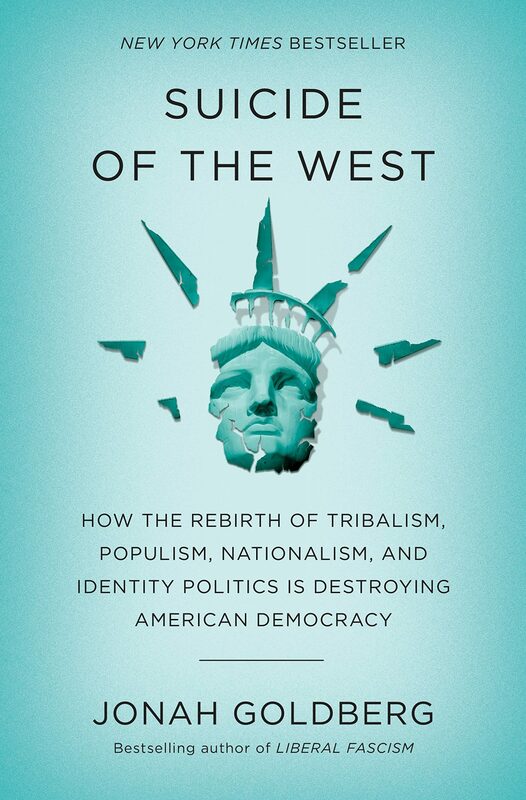 The book’s subtitle, How the Rebirth of Tribalism, Populism, Nationalism, and Identity Politics is Destroying American Democracy, names specifically the movements and ideas that threaten the Miracle. And in part three, Goldberg delivers devastating critiques of each. But in his final analysis, he offers a more basic explanation for the Miracle’s predicament: ingratitude. Though we are all beneficiaries of the Miracle, we’ve simply failed to appreciate it. Indifferent to its unparalleled achievement, we’re willfully allowing it to slip into the abyss. The book begins with a stunning introduction: “There is no God in this book” (3). For the sake of argument, Goldberg jettisons any pretense of religious belief and seeks to persuade readers purely on the basis of “facts grounded in reason and decency.” But as he makes his case, it’s clear time and again that he has saddled himself with an unbearable burden. In constructing his argument, he assumes that “it is incumbent upon all of us to fight for a better society, to defend the hard-learned lessons of human history, and to be grateful for what we have accomplished” (6). As a Christian whose worldview is tethered to the Bible, I’m able to affirm that statement. But on what basis could others affirm it? The assertion certainly fails in Darwinian terms and, absent any theological moorings, is left floating in thin air. Such is the book’s devastating flaw. Though he rightly understands the essential function of religion in society, Goldberg denies its critical importance to his argument. And while I agree with Goldberg in the main, a biblically informed appraisal of both Locke’s ideas and also the Miracle’s core elements would certainly yield a more helpful analysis. For example, such an evaluation of the Miracle’s success might move beyond the quantitative to ask how our escape from poverty has affected us in non-material ways. Moreover, Goldberg’s promotion of capitalism would benefit from the scrutiny of the biblical categories of justice and human dignity. On these points and many others, this significant volume would’ve been strengthened with a different approach. Appreciating the Miracle requires us to view the present through the lens of the past. But we can’t stay stuck in the past; this appreciation needs to be passed on to future generations. Goldberg is correct; the Miracle is worthy of preservation, and we must do our part to tell its story. Goldberg’s book is aptly named. Should the Miracle soon meet its end, its death shall come by suicide. Josh Wester (MDiv, The Southern Baptist Theological Seminary) serves as director of strategic initiatives at the Ethics & Religious Liberty Commission. He’s currently pursuing a ThM at Southeastern Baptist Theological Seminary. Josh and his wife, McCaffity, are members of Redemption City Church in Franklin, Tennessee. You can follow him on Twitter.